Saraswati Institute of Pharmacy (D.Pharm) (Saraswati Institute of Pharmacy (D.Pharm)), Hingoli Published Job Notification for 20 Principal – Principal & More Posts. 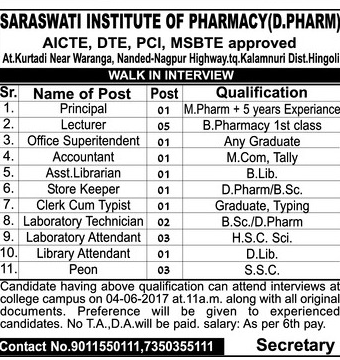 Candidates who wish to apply must look at Saraswati Institute of Pharmacy (D.Pharm) Recruitment 2017. Eligible candidates can come for walk-in-interview on 04-06-2017 at 11.00 a.m.
Education Qualification: M.Pharm / B.Pharmcy 1st Class / M.Com / B.Lib / D.Pharm / B.Sc. For Post wise Education Details follow the detailed advertisement. Interested & Eligible candidates may attend for walk in interview along with all the documents addressed at Kurtadi Near Waranga, Nanded-Nagpur Highway, tq.Kalamnuri Dist.Hingoli. Starting Date, Last Date to Apply Offline at Saraswati Institute of Pharmacy (D.Pharm) which candidates should be remember as follows. Walk-in-interview Date: 04-06-2017 at 11.00 a.m.